I’ve spent the last few days in Zurich for a meeting of the SupurbFood project. Amongst the range of privileges this brings is that we get to visit different projects that are in some way shortening food chains, closing the cycles of nutrients and using land innovative ways. We visited a range of projects in Zurich but I thought at this point I would highlight three that are relevant to discussions the CCRI is involved with at the moment. As I left the UK there was much discussion of the plummeting price of milk and the future of the dairy industry. One answer to this is to change the distrubition of milk so the farmer captures more of the value and consumers get a fresher offer. At the Markthalle Vidautk (Markethall Viaduct) Conradin Flurin (@FlurinConradin) had set up a vending milk for fresh milk, and raised the money from a crowd funding source. Customers purchase a glass milk bottle, and then pay for what they use. A local farmer just outside of Zurich provides the milk, which is pastuerised but not homogenised. You can see more on the rather beautiful website for Stadtmilch or read about in this article. 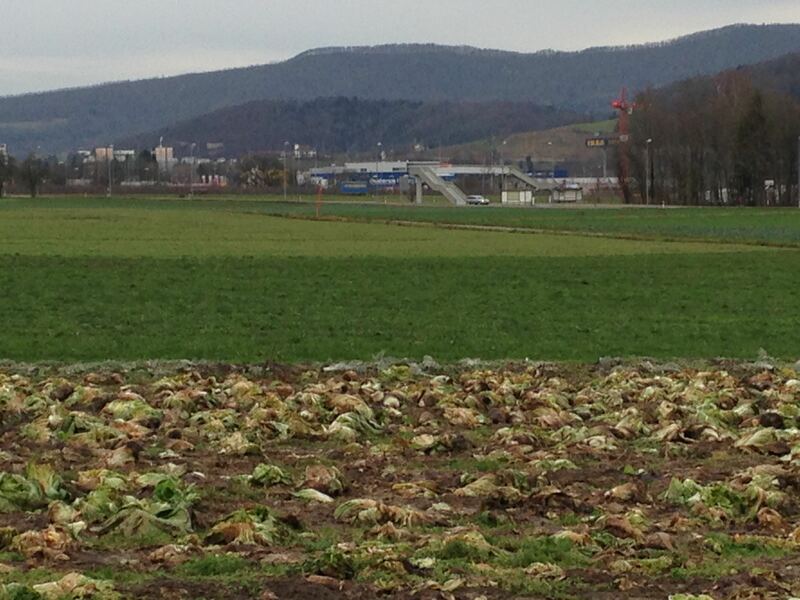 The next project was Ortoloco (yes, Crazy Garden), a CSA farm situated on an organic farm on the fringes of Zurich. After an excellent tour by Ursina and Tina I certainly came to appreciate the gap between this model of a CSA and the standard box scheme. At Ortoloco you buy a share of a harvest as part of a community, and with that community membership comes a commitment to take part in the labour necessary to make the system work. Members purchase a share for 2 people or a share for 4 people, then as well as the veg comes the opportunity to be part of something – working the land, packaging and managing the project alongside professional horticulturalists. The final project in this snapshot was the Quartierbauernhof Wynegg, which I can only describe as something like a cross between a City Farm and a social club. The Quartier is within the city of Zurich, with small livestock, veg and fruit gardens, and some ponies. Members pay a small subscription fee and then can join a wide range of self-organising groups that focus on different activities on the farm. If your son wants to join the ‘Pony’ group then you sign up and he gets to take part, learning how to look after it as well as riding it. Alternatively if you fancy joining the Wine club, or the very popular pig club then that is your choice. Some groups lower the joining fee by selling their produce, the pig club combine that with an annual feast and you can imagine who the (dead) guests of honour are! 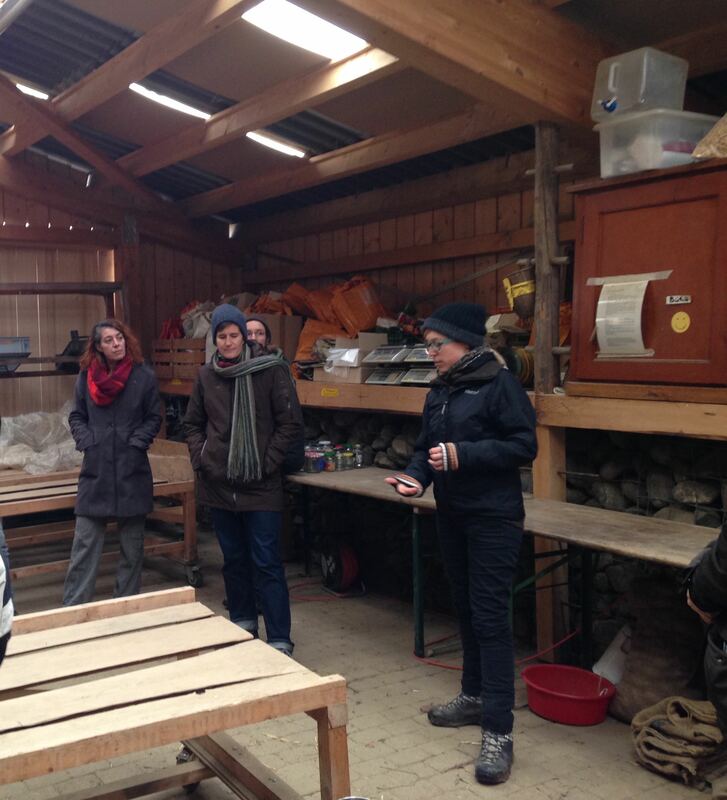 Aspects of these models are very rooted in the Swiss experience, the existance and preservation of very small multifunctional farms, an emphasis on citizen participation, and often the tacit support of the local state. What struck me of all of these projects was the confidence of those organising them and just how applicable these concepts would be in other circumstances. There is a local milk dispensing machine in the Burford Garden Centre. But it is an interesting question whether it is a cultural issue (we British do allotments and horses, but not community agriculture); or whether the farm subsidy system (through CAP as applied in the UK) discourages such innovations. In Scotland, the transition on the edge of the urban area was straight to intensive grain; and I often wondered whether the commercial nature of farming on the edge was such that scope for community engagement was unaffordable in public subsidy terms. CAP, a bar to innovation? I think that the key difference in this case was that this is not an initiative by the farmer but by consumers supporting the farmer. Even with the much smaller Swiss farms (40 cows on the one that supplies Stadtmilch) it is not a major economic concern for the farmer. I also wonder if one of the problems in the UK is not the CAP (not common, not agricultural, not a policy) but planning laws. Peri-urban and green belt land is treated as if it were deep in countryside and I wonder if planning law encouraged peri-urban food supply that it might be different. Maybe an issue for neighbourhood plans, if there is local demand. Even so, I don’t see any planning reason against it. Farm diversification and reuse of buildings is strongly supported.